Here at Rhine Valley Game Calls we offer a selection of Swivels. There will be more added soon, so you might want to check back often to see what is new. Southbend Brass Snap Swivels Size 14. Southbend Brass Snap Swivels Size 10. Southbend Interlock Snap Swivels Size 7. Southbend Snap Swivels Size 12. Eagle Claw Brass Barrel w/Snap Size 7. Eagle Claw Brass Barrel Swivel Size 3. 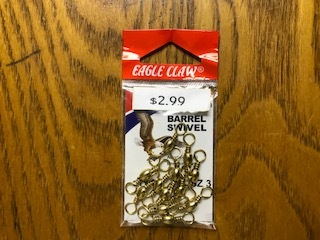 Eagle Claw Brass Barrel Swivel Size 1/0.